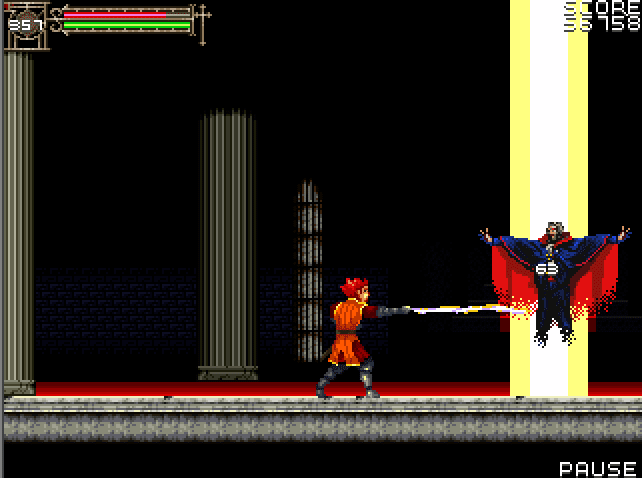 It’s hard to know what the future holds for the venerable Castlevania franchise. Konami themselves seem content to do nothing but re-release Symphony of the Night over and over again, former franchise head Iga has the just-about-legally-distinct Bloodstained: Ritual of the Night on the way and there’s the Netflix cartoon, but for honest-to-goodness Castlevania games? Who knows when we’ll see another. But this is the Halloween season and I want to try a Castlevania game that I’ve never played before, goddamnit – and that leaves me with only one option. 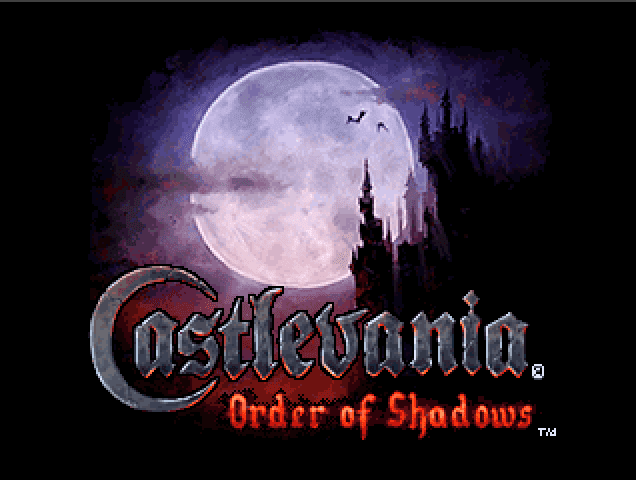 It’s time for the 2007 game for mobile phones, Castlevania: Order of Shadows! That’s right, back in the day you could pay about six bucks to download a Castlevania adventure created specifically for mobile phones, with a whole new plot and cast and everything. I say “new cast,” obviously Dracula and Death are in it. However, because this is the year 2018 I couldn’t just play Castlevania: Order of Shadows on my phone. Instead I had to go through a lot of faffing about to get it running well enough to play all the way through, a process that involved visiting shady Java download websites, wrangling various setting into place and, eventually, resorting to playing the bloody thing on my ancient laptop. That’s the laptop that I wrote the first ever VGJunk articles on, and it was old then. I had to have a desk fan blowing on it stop it from overheating. 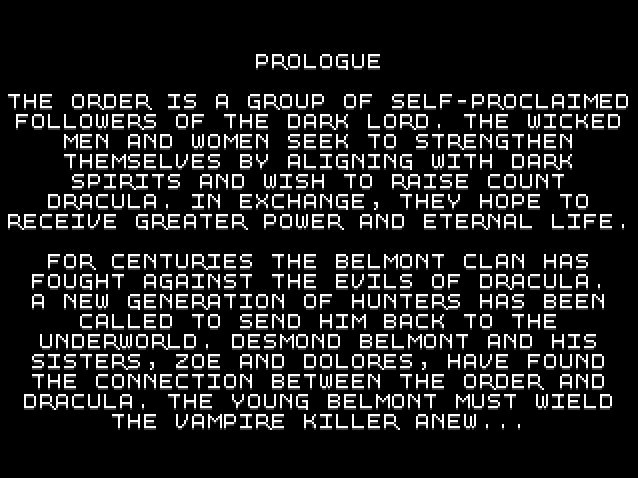 In retrospect, Castlevania: Order of Shadows was not worth the effort. The all-expenses-spared prologue fills you in on the backstory to this latest climactic battle of good versus evil. A dark, sinister order – an order of shadows, if you like – are planning to resurrect Dracula, and a Belmont must head out and whip them until they stop doing that. 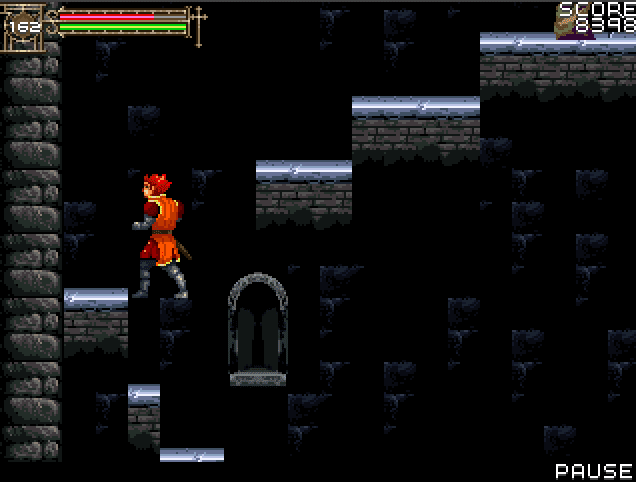 It is not exactly a story that breaks the mould established by previous Castlevania games. Here is the Belmont in question. His name is Desmond Belmont, and he’s assisted by his two sisters Zoe and Dolores. Desmond has inherited both the sacred monster-slaying mission of the Belmont clan and their curious posture, where arms are forever bent at the elbow and they walk in mighty strides. He’s also very orange. It makes him easier to see against the dark backgrounds, and I suppose that would be helpful if you were playing this on a mobile phone. 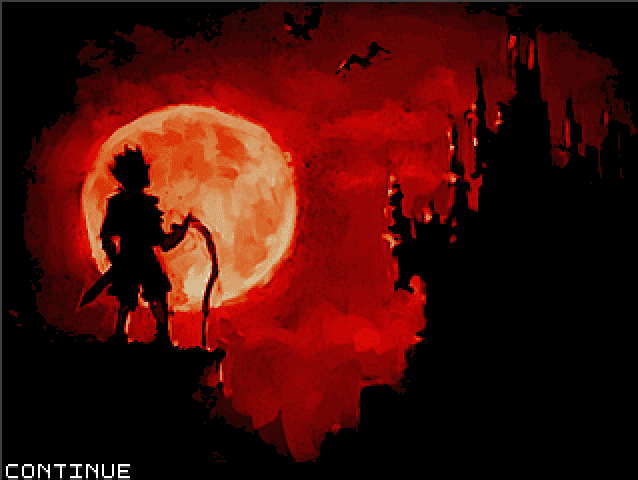 The action begins and hey, this is a Castlevania game! I’m in a hallway, there's a candle with a heart inside, I’m about to whip a zombie that’s waving its hands in the air like it just don’t care. 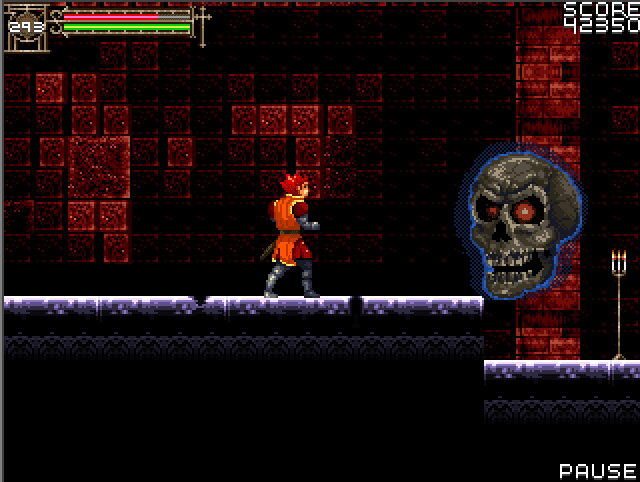 It doesn’t get much more Castlevania-y than that. 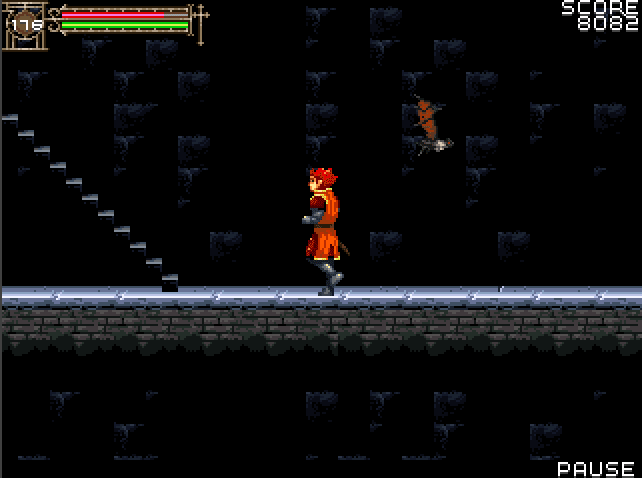 The gameplay in C:OoS will be immediately familiar to anyone who’s played a Castlevania game in the past, with Desmond making his way through a variety of locations, whipping monsters and using his stiff-legged jumping “skills” to clamber between platforms. 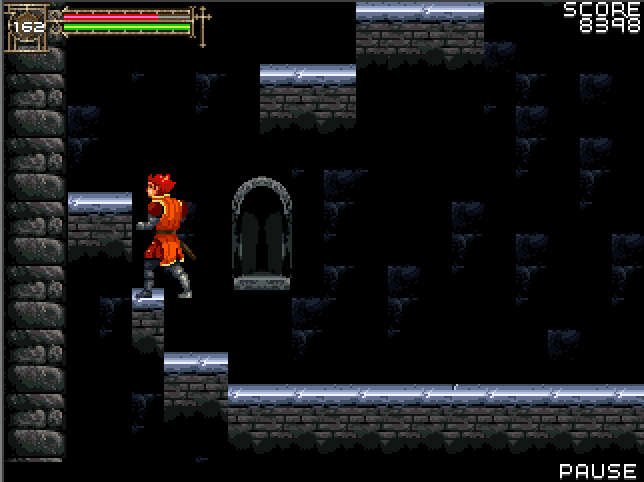 You control the game using either the number pad keys or the little joystick-nub-thing that many mobile phones of the time had, with the main differences from real Castlevania games being that you press up to jump, rather than a button. This means that using your subweapon involves pressing a separate button, because up is reserved for jumping. That’s right, there are subweapons – I managed to find the cross and the axe early on. They’re a little… strange. For starters, they’re far weaker than they used to be, with the cross taking three or four hits to defeat enemies that can be slain far more easily with a single flick of the whip. 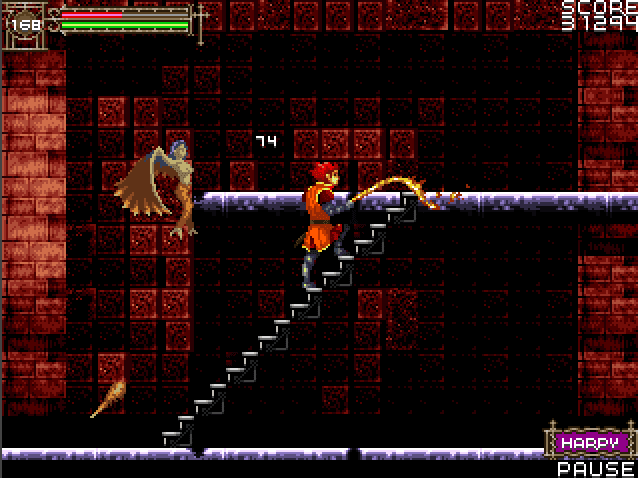 Oh, and the axe travels horizontally, rather than in the usual arc you’d see in traditional Castlevania games. The biggest departure from the familiar subweapon system is that you can carry more than one subweapon at a time. In fact, once you’ve grabbed them, you’ve got them forever, and you can change which one you have active by equipping it via the game’s pause menu. That’s an interesting feature, and after playing lots of Castlevania games where a chunk of the challenge came from actively avoiding certain subweapons I’m kinda glad of its inclusion. After breezing through the early corridors, Desmond finds himself in the bone pit. You know, where they store all the bones. Is this like an assembly lines for skeletons? There are definitely skeletons around, you can see a pair of bony legs at the top the screenshot above. I suppose it’d be more like a scrapyard for skeletons, really. If you’re looking for a spare scapula from a 1758 Transylvania Peasant, this is where you’d come. 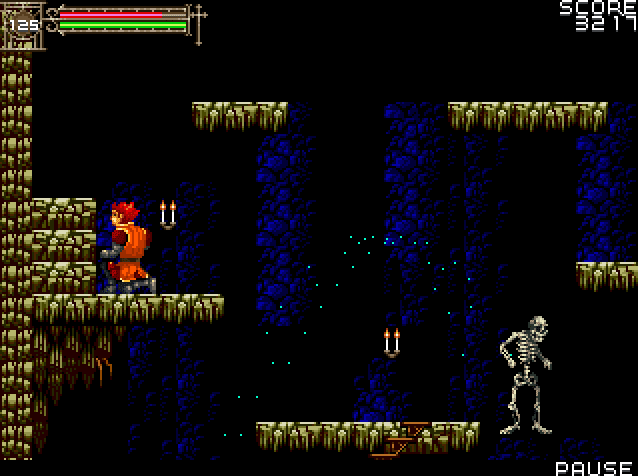 Slightly further on, and now we’re platforming thorough a series of caves while skeletons throw bones at us. “So, how’s that going?” you might ask, and the answer is the kind of low, throaty moan you might make if you unexpectedly stepped in something soft with no shoes on. You might not be surprised to hear this, but Castlevania: Order of Shadows is not the most enjoyable game to actually play. It’s leaden and ponderous, with Desmond lashing out his whip so slowly the only conclusion is that he’s trying to tickle his foes to death. Jumping is equally awkward, particularly when trying to avoid enemy attacks: pressing up will sometimes make Desmond jump straight upwards, as you’d expect, but then at other times it makes him jump diagonally forwards in the direction he’s facing. For the life of me I never figured out what triggered which jump, and that made the game’s (thankfully not-too-taxing otherwise) jumping sections a real chore. 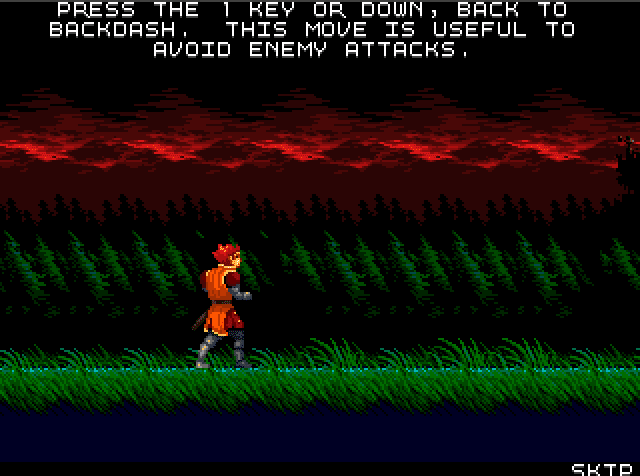 If you’re walking forwards and hit the attack button, you have let go of the movement key and then press it again before Desmond will resume walking after the attack, further slowing down the action. Desmond’s hitbox is not so much a box as a goddamn circus tent, with you taking damage from enemies that aren’t in the same sodding postcode, never mind touching you. All in all, the gameplay is bad. Did I get that across? And don't forget I'm playing this on a keyboard, so god only knows how it felt on a phone. The first boss is the Order Knight, an armoured chap with disproportionately tiny legs and a pair of big swords. Oh, and he can throw daggers that are basically unavoidable thanks to to the lag on the controls. I tried throwing my own projectile weapons at the boss, but they do very little damage so in the end I had to go toe-to-toe with the knight, hoping that he’d run out of health before I did. It didn’t go great. “Well, you really ballsed that up,” says Death as he drifts down from the top of the screen to claim Desmond’s immortal soul. 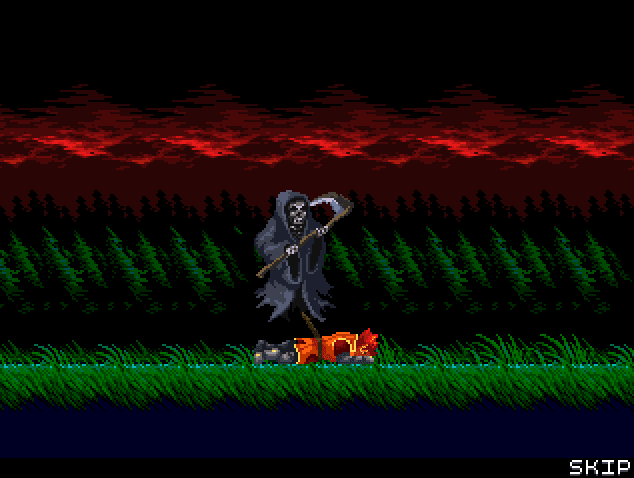 Admittedly this is neat death animation, with a nice sprite of capital-D Death that’s clearly not up to the graphical level of Symphony of the Night but possesses its own bony charm. Also nice is the fact that running out of health is essentially meaningless in this game. You hit continue and you’re dropped back at the start of the screen you died on with a full health bar. 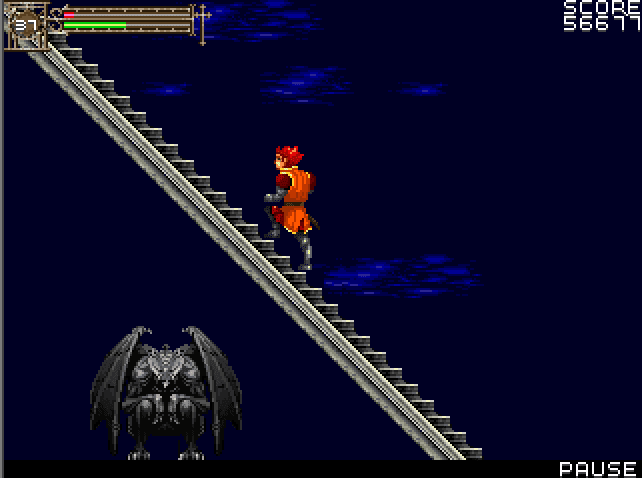 This time when I whipped the knight it did run out of health before me, so that’s the first area complete. Defeating the knight grants Desmond access to the back dash. Don’t believe the lies of that description, it is not useful for anything. The most interesting thing about the back dash is that, hey, what’s the first thing you’re going to do when you’re given a new move? You’re going to try it out, right? So I backdashed on the first screen of the new area and I backdashed off the screen and into the previous boss arena. Thankfully I didn’t have to fight the knight again. But hey, C:OoS has backtracking! 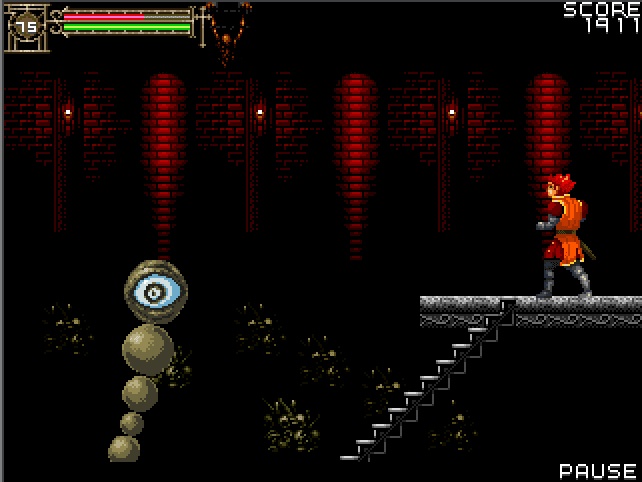 It’s a Metroidvania! No, it is not. There’s one place in the game where you might have to revisit an earlier area. As much as this game wants you to think it’s cut from the same cloth as Symphony of the Night, with its collectable weapons and ability to travel back to previously-cleared areas, in reality it’s a very linear game. You do get experience points and level up as you play, but it seems to have a very minor effect on the gameplay aside from raising Desmond’s maximum health. 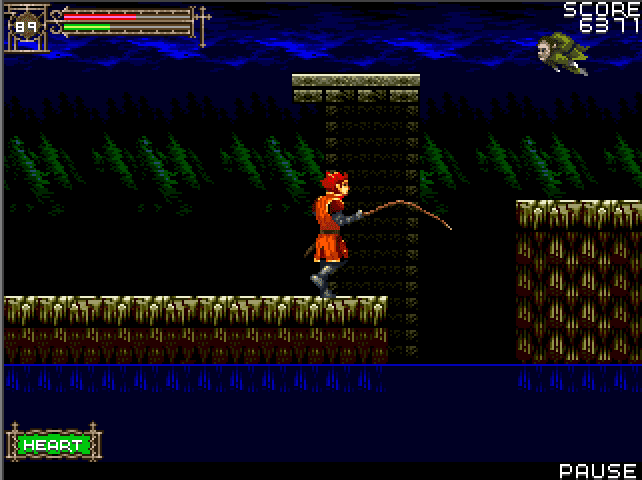 Pressing ever onwards, Desmond negotiates a crumbling waterway and faces some fleamen, one of Castlevania’s most hated monsters due to their erratic bouncing movements. I’ll admit I was worried. How was I going to avoid these capering bastards when Desmond has all the grace and agility of a suitcase full of bricks? It turned out not to be a problem, because Desmond’s whip stays extended for a long time and the fleaman were perfectly willing to jump straight into it and die. I think the one pictured above was the closest a fleaman ever got to me. Also starring in this stage are these familiar witches. Sadly they do not turn into cats and run away when you defeat them like they do in Symphony of the Night. I know, I know, there are a lot of limitations thanks to this being a mobile game, but still. The rest of the stage comprises a tedious slog through the kind of barren, grey rooms you can see above. The occasional bat flutters past, disinterested in the entire sorry affair. I tried to hit some of the bats with my new secondary weapon, the Platinum Blade. Unusually for the series, C:OoS features subweapons that are melee rather than projectile attacks: in this case, the Platinum Blade allows you to sweep a sword in front of you. 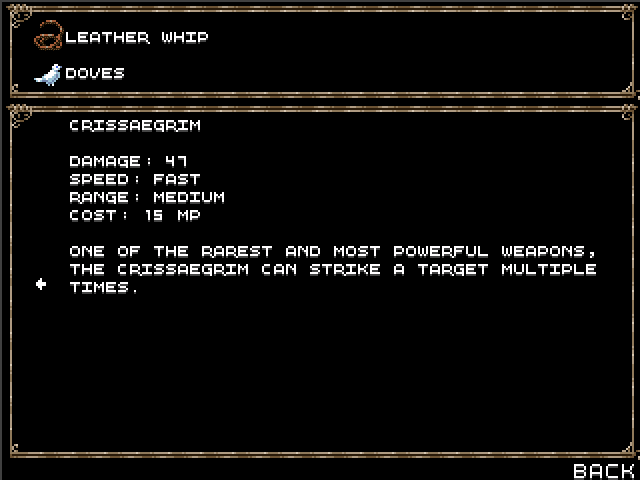 I think it’s supposed to be weaker than your whip but faster to activate, but the range advantage of the whip is so important that almost all of the close-range subweapons are a waste of hearts. ...but you actually land “on” the platform above, with this somehow counting as Desmond standing on the platform. Is an unintended quirk of the engine, or was it included intentionally to make it a bit easier to get around? I have no idea, but if for some reason you decide to play this game then I recommend making the most of it. The boss is two bats. Big bats, granted, but still just bats. I sure wish that the axe in this game arced upwards when you throw it. I’m kidding, of course: just use the whip. It really is all you need. Are they, though? Because I’m not really seeing any difficulty curve at all in this game. A difficulty plain, maybe. A plateau of challenge. I was going to say that the twin bats were actually easier to defeat than the Order Knight, but I was making that first battle more challenging for myself by trying to avoid the boss’ attacks when I should have just stood there and furiously whipped away like a Pharaoh trying to get his pyramid built ahead of schedule. The beginning of the next stage is no more interesting than the end of the last, with more extremely simple platforming and backgrounds for which the concept art must have been a picture of someone shrugging non-committally. Not wanting to be outdone by the bats, some Medusa Heads put in a shift as this area’s lazy, unthreatening hazard. 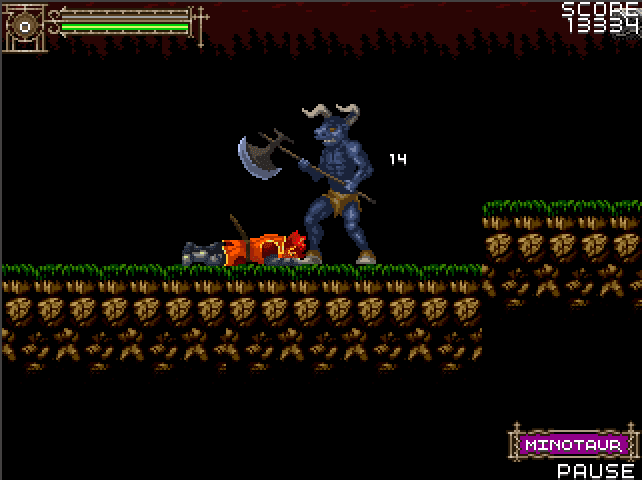 Then I got a few screens further in and this minotaur flattened me in seconds. This took me by surprise, because every other enemy in the game thus far has done negligible amounts of damage if they somehow managed to slip past my whip, whereas the minotaur can kill Desmond in three hits and barely takes any damage from your attacks. 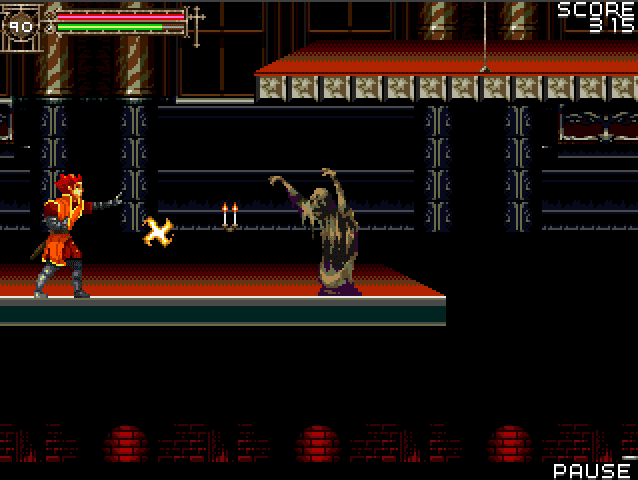 My experience playing other Castlevania games told me that the best strategy would be to bait out the minotaur’s attacks, especially his dashing attack, and then hit him while he recovers – but this strategy proved useless because the minotaur’s hitboxes are seemingly made up on the fly and bear no connection to the position of either the minotaur or his axe. In the end I toughed it out by eating all the health-restoring chicken legs that I’d squirrelled away in my inventory and whipping repeatedly, and my reward was… the Crissaegrim? The most powerful weapon in Symphony of the Night, a whirling vortex of blades that transforms the wielder into a cross between a ribbon-waving gymnast and a combine harvester? Yes, that Crissaegrim. Except in C:OoS it’s a subweapon that gives you a medium-strength, short range attack as Desmond swings the blade once. The saddest thing is that this is probably the best subweapon. It turned out that beyond the minotaur was a dead end, so I had to go back a little and start exploring these underground caves. Skeleton archers are the new threat here, but to balance things out there are suddenly magic spells dropping from every other candle. You can see one in use above, the Firestorm spell that drops a carpet of lingering flames from the sky. They’re all single-use items as opposed to the equippable subweapons, but there are quite a lot spells to collect, from simple projectile attacks to projectile-repelling barriers and even limited invulnerability. You might think these spells would hammer the final nail into the subweapons’ coffin, but the problem is that you have to get into the right position, pause the game, scroll down to the inventory, select your spell and then use it. This rather takes you out of the game, and C:OoS is already such a slow, plodding experience that spending twenty seconds navigating menus just to throw a fireball at a bat is a ludicrous proposition. Waiting at the bottom is Medusa. She’s staring at you, with her eyes. She can indeed turn Desmond to stone with a glance, but he gets over it fairly quickly and Medusa’s sword has nothing like the range of your whip, so it ends up being a rather one-sided battle. Far more interesting is that victim in the background. 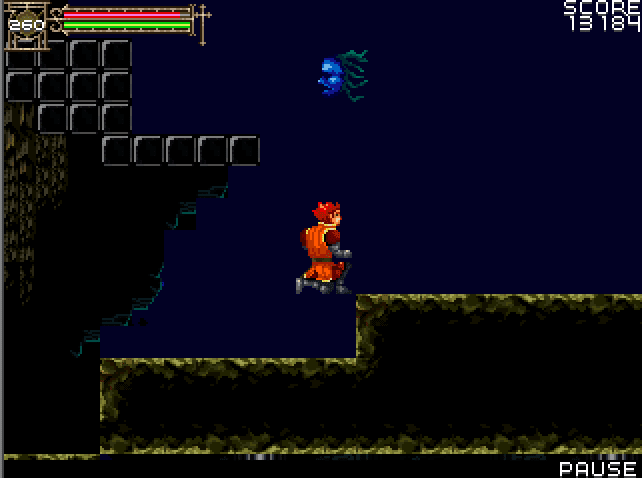 It seems that at some point in the past Medusa managed to defeat Simon Belmont. Given that Medusa is easily beaten by Desmond – an arthritic, shambling warrior whose whip-arm travels with all the power of Ratty from Wind in the Willows rowing his little boat – there must be something more to that statue. Maybe it is a statue, carved to commemorate Simon Belmont’s many victories, and Medusa grabbed it so that people would think she overpowered the famous vampire killer. 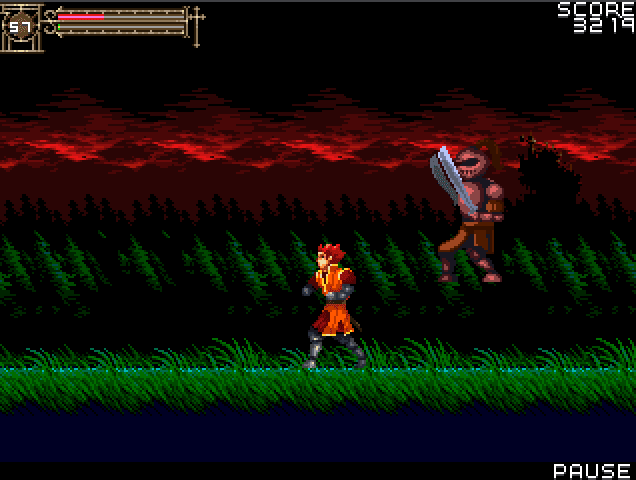 If it is Simon Belmont, let’s hope he stays petrified, because the alternative is dying from embarrassment. The reward for beating Medusa was the double jump ability, so now I can travel back to where I fought the minotaur and jump to the high platform that leads onwards. Oh, and I found a fire whip. That’s nice. The next zone is more of the same, with the faintest hint of a maze-like layout half-heartedly dribbled on top. There are a few places where if you fall down you have to climb up a few screens to get back to where you were, and if you think that sounds like pointless filler then you’re absolutely correct. For all its flaws, and they are numerous, Castlevania: Order of Shadows features huge ghosts that take the form of spectral skulls and float around menacingly and thus deserves some measure of our affection. Granted, there’s not much else a giant ghost skull can do besides float around menacingly, and again they don’t look as good as their Symphony of the Night counterparts, but I’m still very pleased to see them. This hooded chap is Rohan Krause, the latest in a long line of people hoping to be Dracula's alarm clock. He also killed Desmond’s parents, so this time it’s personal. I’m trying really hard to care, I swear. Rohan’s a wizard, and he attacks using the same arsenal of spells that Desmond’s been collecting on his travels: here you can see me getting immolated and shot in the back. This is the only time in the game I got any use out of the spells, specifically the “Reflect” spell that provided a barrier that was very temporary but lasted long enough for me to get a bunch of whipping done while Rohan mumbled some incantation or whatever it is wizards do. I did die the first time I tried this battle, but that’s hardly a bad thing – as mentioned previously you just restart the fight with a full health bar, and you have infinite lives. Oh, and pockets full of delicious roast chicken, should you need it. But alas, killing Rohan has provided the blood required to resurrect Dracula! This is why the Belmonts should invest in some less-lethal weaponry like, I dunno, rubber throwing knives or a whip with a taser sellotaped to the end. 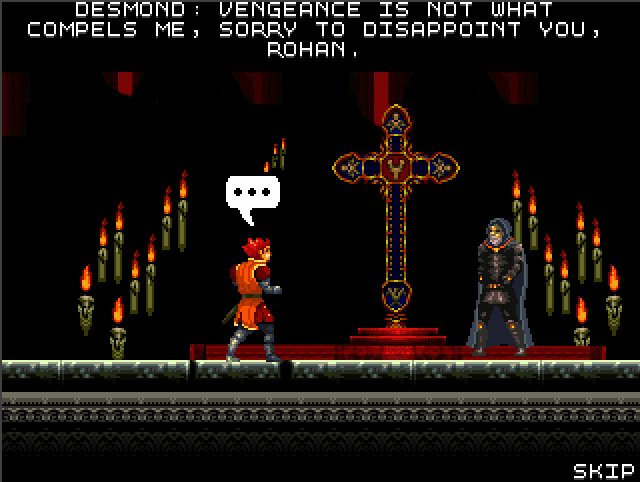 Desmond doesn’t believe Rohan’s claims, but Rohan tells him to venture to Castlevania and see for himself. 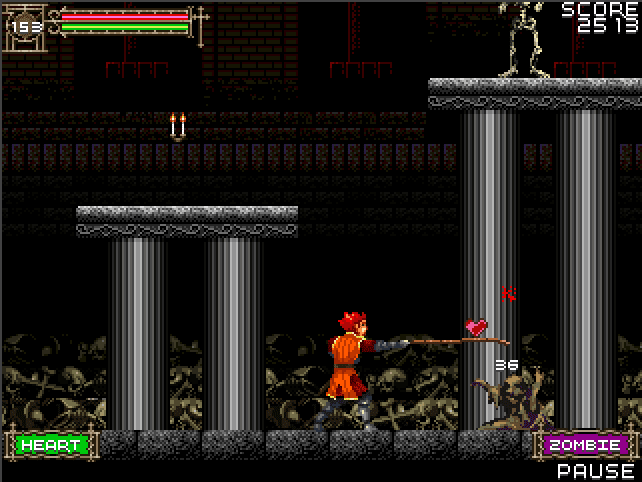 Oh boy, Castlevania! At last! Surely this is where C:OoS is going to pick up, and I can’t wait to explore the nightmare halls and dank catacombs of Dracula’s castle itself! 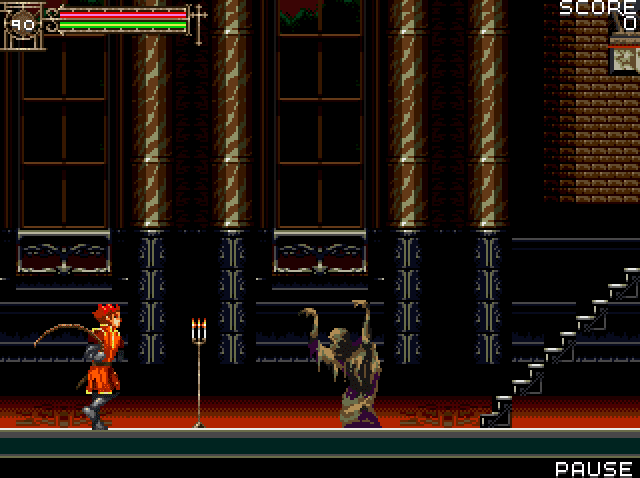 Okay, so Castlevania isn’t quite the sprawling labyrinth it used to be. In fact, it’s just a couple of rooms containing a surprisingly large amount of fermented soy beans, plus the iconic staircase leading up to Dracula’s chambers. 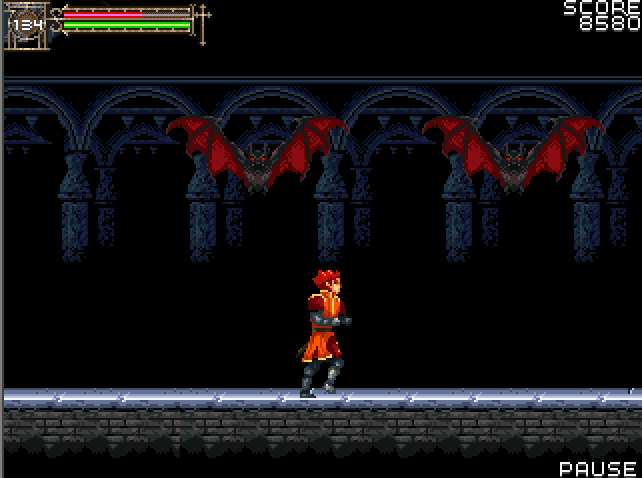 Making a Castlevania game where you travel to Dracula’s castle and said castle is made up of three monster-free rooms is a bold choice, but I can’t pretend to be disappointed. I’m more than ready for this game to be done with, so let’s go and deal with Dracula. Desmond is very surprised that his actions have helped in Dracula’s resurrection, despite being told five minutes ago that this was the case. 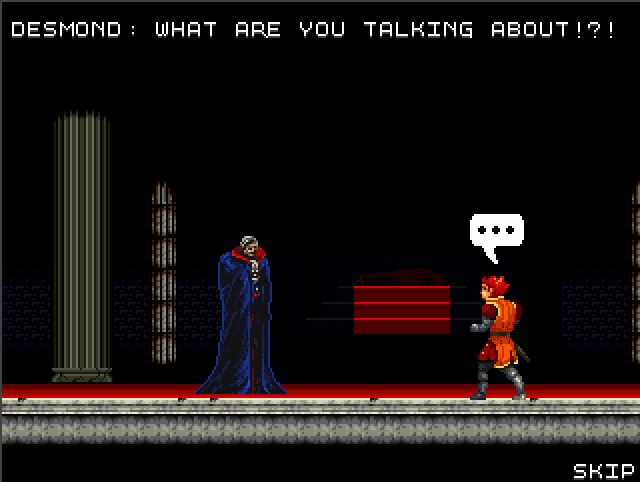 He’s a Belmont, too, so it’s not like he should be shocked that Dracula’s up and about. I’m beginning to suspect there’s a reason the other games never include Desmond in the great pantheon of legendary vampire killers. You know that fight against Dracula’s first form? 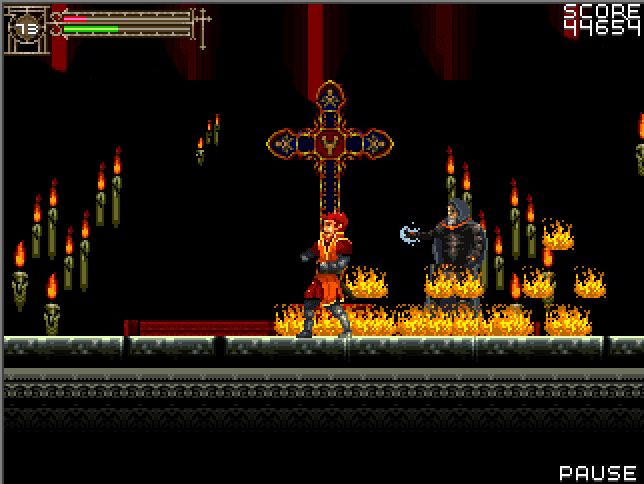 The one that any Castlevania fan has played through umpteen times before, where Dracula teleports around the screen, popping back to the material realm to throw fireballs? Yeah, it’s that battle again, with a few important changes. One is that you don’t have to whip Dracula in the head to hurt him, any blow will do. 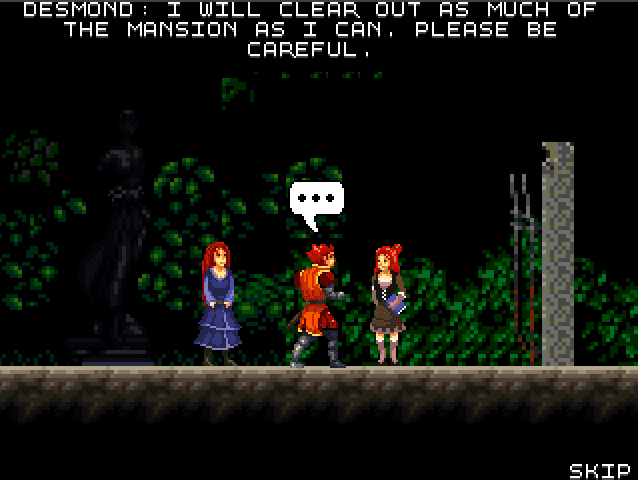 I assume this is to counteract that fact that Desmond’s glacial reactions and the abysmal controls make it almost impossible to avoid any of Dracula’s attacks. The other is that you can chow down on fermented soy beans and the one solitary taco in the game to keep your health topped up, and if the mental image of a Belmont pausing mid-Dracula-battle to wolf down a taco doesn’t make you smile then there’s something wrong with you. 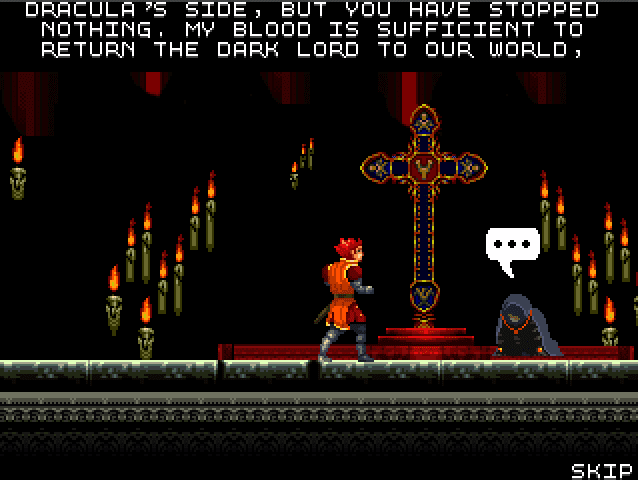 Perhaps feeling slightly embarrassed to be involved with this game, Dracula forgoes his usual second form transformation and goes straight to the “not actually being killed” part of most Castlevania games. 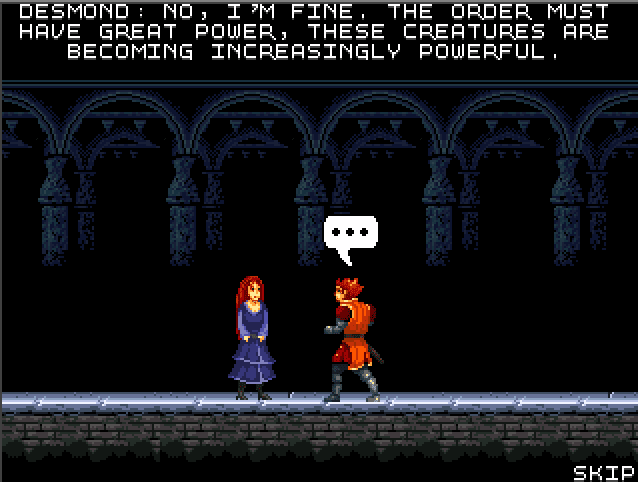 The day is saved, Desmond swears that there’ll always be another, more competent Belmont around to stop Dracula and Castlevania: Order of Shadows is over. You get a bit of epilogue text explaining that Castlevania is still around, and then a picture of Desmond looking at the castle. He seems to be wearing shorts. Look, after a long day of monster-slaying and making the game think you’re standing on a platform when you’re actually levitating nearby, the first thing you’ll want to do is slip into some more comfortable clothes. Well, that was a heck of a thing, wasn’t it? It tried, bless it, but Castlevania: Order of Shadows ended up being somehow worse than I expected. 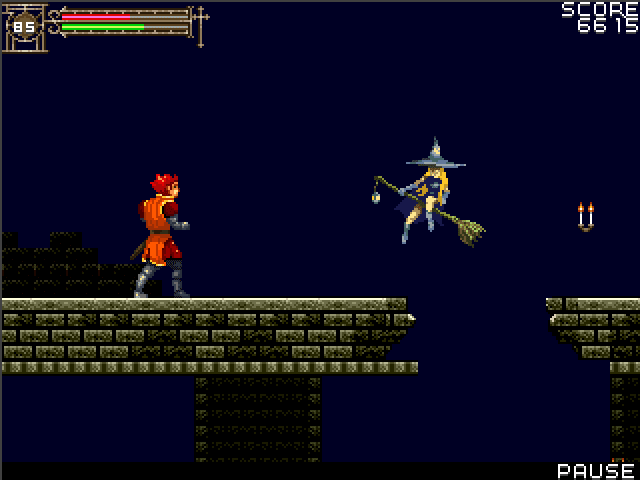 On a basic level it’s a real chore to play, with no sense of power behind any of your attacks and none of the relentless, rhythmic aggression of the classic Castlevanias. It seems to be caught in two minds, unable to decide whether it wants to be a more open explore-em-up like Symphony of the Night or a straight-ahead action-platformer, and sadly it fails at both. The controls are awful, the graphics mostly bland and the music – and this is a cardinal sin for a Castlevania game – is terrible. 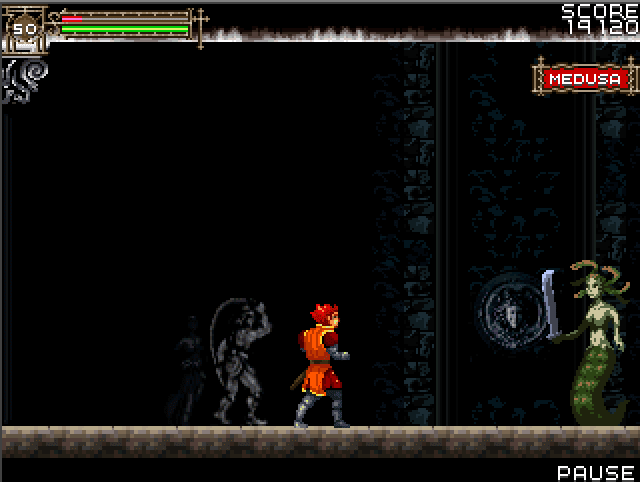 Once you’ve cleared the game you are given the option to switch on “Classic” music, which replaces the soundtrack with music from the original NES Castlevania, but there are two problems with that: coming from a mobile phone it’s a horrible squeaky mess, and to hear it you’d have to play Castlevania: Order of Shadows again. Nobody should have to suffer through that. Really the only saving grace is that the game is so easy, with the infinite lives and very generous checkpoints. If the game had been any more difficult I doubt I’d have had the willpower to finish it. Not when I was controlling what feels like Pinocchio if he said “I wish I was not quite a real boy.” So, in conclusion, Castlevania: Order of Shadows is a bad game. Probably could have saved myself three and a half thousands words there, huh? As for the Halloween-O-Meter, this game was difficult to rank. I mean, it is technically a Castlevania game and that usually means a guaranteed ten out of ten, but because C:OoS is lacking in so many departments I think an eight is the highest I can go. It’s got witches and bats and malevolent hovering skulls, but it’s missing that certain something that would push it higher. 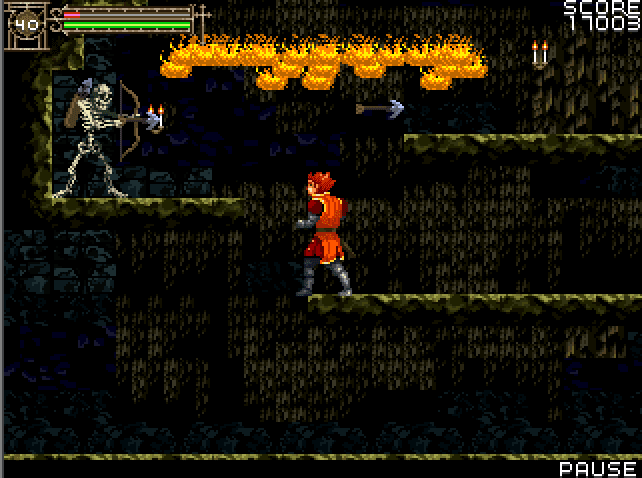 Rescuing a devil-worshipping band in Seikima II: Akuma no Gyakushuu! My phone from the time wouldn;t have been able to handle it either, which I suppose is a blessing. Whoever carved that statue of Simon Belmont must have been a big fan of Haunted Castle. It looks a lot like his sprite from that game. No surprise he'd dead, then, that game's bloody impossible. Ah yes, one of the more mysterious CV games from when I was in high school. A shame that it's not actually very good. I'm happy to have solved a mystery, at least. Could you explain how did you run it? I remember trying to run Java games on Android a few years ago but I never managed in the end. I don't remember if I ever tried on Windows (even if it's XP, you could always turn to a VM if Win10 is not good enough). I liked those Java games, their old school feel, the input with actual keys, even if those keys are just a numpad. I'm not a fan of games with touch as a main control, and much less of the mindless mobile games of today. Anyway, I fondly remember those games "Afraid of the Dark" or something, where you had to navigate the levels making sure your path was illuminated, for there were "things" lurking in the shadows. 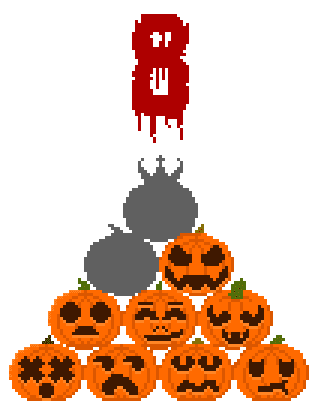 Man, I never thought you could make a simple mobile game in java so spooky. Great ambience. They were by Rovio I think, before all the Angry Birds shitshow. The Doom RPGs were good too and, although short, the Splinter Cell games were cool too. I used a program called Kemulator on a Windows Vista machine and messed with the config files a bit. And yeah,I definitely played more phone games when they used proper butons, I've got big hands. It seems Konami is working on a mobile game that's going to be similar to Harmony of Despair. It's probably going to be a far cry from a honest-to-goodness Castlevania, but at least they didn't completely give up on making more games, right? As one of the apparently few people who enjoyed Harmony of Despair, I'm not sure how to feel about this news. I imagine story and premise would still be better than Lords of Shadow 2. This really does take me back to the Java gaming days. I spent a lot of time on the Prince of Persia games,Ubisoft had a surprisingly firm grip on the "Java games based on console games" market for a few years. Yeah, some of them look pretty good, I'd probably get into them more if they weren't such a pain to run. This fits right in with all the bootleg games you cover that are patched together with graphics from other games. 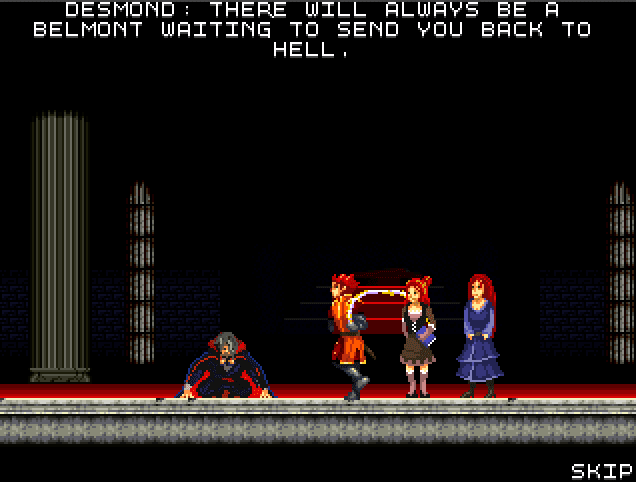 Yep, Desmond is very much a Poundland Belmont. Desmond looks like Lion-O from the Thundercats reboot.